UNUSUAL JULY PATTERN: A rather anomalous upper air pattern continues for midsummer, as we have a deep upper trough over the eastern half of the U.S. in place this morning. This was responsible for severe storms over parts of Alabama over the weekend, including an EF-0 tornado near Opelika Saturday. Today will be partly sunny, and a few scattered showers and storms will fire up this afternoon. The chance of any one spot getting wet is in the 40 to 50 percent range, and temperatures will be “cooler” with a high only in the 83- to 86-degree range. Not much change tomorrow. It should be partially sunny with a few scattered showers and storms, especially over the eastern two-thirds of the state. The high will be in the mid to upper 80s. WEDNESDAY THROUGH FRIDAY: Drier air creeps into Alabama, and these three days are looking relatively dry with only isolated showers around, mostly near the Georgia border. Otherwise, look for mostly sunny days and fair nights with highs returning to the low 90s, which is what we expect in late July in Alabama. THE ALABAMA WEEKEND: Not much change Saturday — expect a good supply of sunshine with only isolated showers; the high will be in the low 90s. Then, on Sunday, moisture levels rise with an increase in the number of scattered showers and storms. Otherwise, we are forecasting a mix of sun and clouds with a high between 88 and 91 degrees. NEXT WEEK: It looks like temperatures will be below average much of the week, with highs in the 80s. There will be enough moisture and instability for scattered showers and storms each day, mostly during the afternoon and evening. 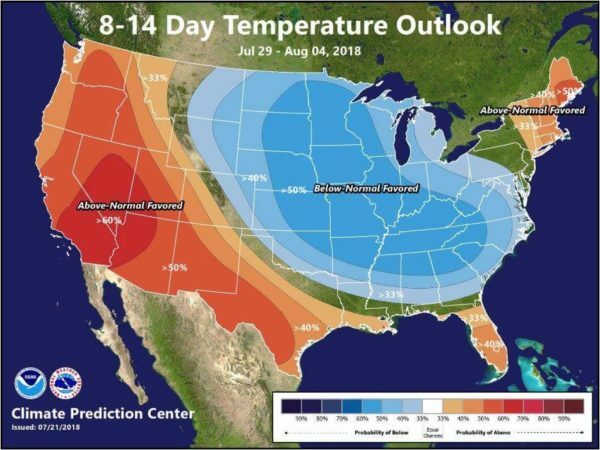 It’s interesting that the Climate Prediction Center outlook for July 29-Aug. 4 suggests below-average temperatures for Alabama and points north; this is typically the peak of the summer heat here. TROPICS: All remains very quiet across the Atlantic basin, and tropical storm formation is not expected through the week. LEE COUNTY TORNADO RATED EF-0: The tornado that moved from near Opelika to Beauregard in Lee County Saturday afternoon was rated EF-0 by a National Weather Service survey team yesterday. It was on the ground for 6.3 miles and had estimated winds of 85 mph. There were no injuries, thankfully.